The subject of bicycle helmets seems to raise all sorts of issues. Should they be compulsory? Do they actually save riders from head injury? Well I’m not here to debate all that, but I thought it might be helpful to provide a few tips on buying the right helmet for female cyclists. For what it’s worth, I don’t think helmets should be compulsory, just like I don’t think seatbelts should be in cars. My thoughts around this subject are more to do with the ‘nanny state’ idea than anything else. I believe that we should take personal responsibility for our own safety and those of our children. That’s not to say that I don’t wear a seatbelt or a helmet, but it should be my choice, not some faceless politicians. But I’m a law abiding citizen and in the country in which I was born and choose to live bicycle helmets are compulsory, so I obey the law and wear one. Just to clarify one point, if helmets were not compulsory I would still choose to wear one while riding my road bike, particularly on the road but I would like to have the choice not to wear one when I’m undertaking a more leisurely style of riding and not riding on the road. I work in a bike shop so sell helmets on a daily basis and I often get asked by my customers (both men and women) – How does it look? And I usually answer – Like a helmet! So anyone who thinks they look really good in a helmet is probably kidding themselves. They don’t look great but they serve a purpose. Most major brands of helmet include a few women’s specific helmets, but from what I’ve ascertained, these are usually smaller sizes and more feminine colours. So it’s not really necessary to buy a women’s helmet but if you want to colour coordinate then a women’s version might be for you. 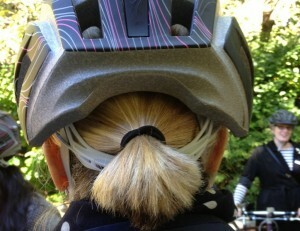 Specialized makes a few of its female specific helmets with an adjustable ‘fit system’ that allows you to adjust the plastic strap that controls the fit of the helmet so you can put your ponytail through (as pictured). I have short hair so it’s of no use to me but it is a good feature for women with long hair. I assume there are other manufacturers offering something similar, or if not, there will be soon. My helmets (I own four of them) are either white or neutral colours so they will match with most things. I went riding with three other women last week and interestingly we all have the same S-Works Prevail helmet in white/silver and I assume we all chose it for the same reason. It goes with everything! Black helmets are also quite trendy and there’s lots of black bikes available to match them. But I think it’s better to go for a brighter colour so that it’s easier to be seen. I see a lot of riders fully decked out in black including a black bike and they are very hard to see, particularly in low light. Some helmet manufacturers recommend that you replace your helmet every three years. In my research for this post I came across the mention of some testing undertaken by helmet manufacturer MET which suggests that a helmet is good for up to eight years if used in accordance with the helmets instructions. The Snell Foundation which is a US group that tests helmets and certifies them according to the Snell Standard, recommends that helmets are replaced every five years. All agree, that you should replace your helmet immediately if you crash and hit your head. According to the website helmet.org “the foam part of a helmet is made for one-time use, and after crushing once it is no longer as protective as it was, even if it still looks intact…… if you can see marks on the shell or measure any foam crush at all, replace the helmet.” Many manufacturers offer a discount for crash replacement helmets and I’ve even heard of free replacements for damaged helmets from some. The other thing you need to ensure, is that you buy your helmet in Australia if you live here, so that it has an Australian Standards sticker on the inside. This is important if you want to race or participate in an event because helmets are often checked by officials for the sticker and some insurance companies will also demand a photograph of an Australian standards sticker. Lastly when you’re buying a helmet you need to determine how much you are going to wear it and therefore how much you would like to spend on it. At my shop we sell Specialized helmets that range in price from the basic Align or Sierra for $69, up to $299 for an S-Works Prevail or Evade. Plus, there are many steps in between. As you pay more the helmet gets lighter, has larger air vents and is more durable. They all do the same job so don’t stress if your budget is small. Having said that, I wouldn’t head off to K-Mart and buy one for $12. Remember – you get what you pay for!! !